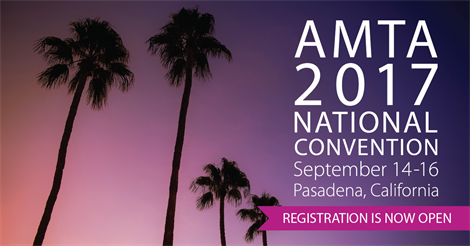 The AMTA 2017 National Convention is your destination for massage therapy continuing education, networking and fun. Find out why you should attend the largest conference in the massage therapy profession! 1. Engage in rigorously vetted continuing education. Advance your massage therapy career with hands-on techniques and get the latest information in massage research, self-care, business and ethics. 2. California Sunshine. Enjoy the warm southern California climate and year-round sunshine, just 10 miles from downtown Los Angeles! You may know it for the Rose Bowl, but Pasadena’s charm includes walkable stores, sidewalk bistros and nightlife. Explore California with these free travel itineraries. 3. Network with the massage profession. Make connections with leaders in the massage therapy profession and exchange ideas with like-minded peers. Find your people at AMTA’s social events. 4. Try new products. AMTA’s extensive Exhibit Hall features products and services to enhance your massage therapy career. 5. Connect with massage educators. Whether you’re currently teacher or thinking of becoming one, attend social events and education developed specifically for massage therapy educators. Register early to save $89 and receive the best choice of continuing education classes!